Basement Mold Remediation PA- Professional, Guaranteed. Your basement is one the most common places to find mold in your Pennsylvania home. Basements are notoriously damp and have poor air circulation, not to mention they present a high risk of water seepage through your foundation walls. Once mold takes hold in your basement, it can spread quickly due to conducive conditions. If you suspect mold in your basement, call now. Help is just a phone call away. Mastertech’s certified basement mold remediation experts can identify if your basement has a mold problem and develop a safe, effective and efficient Eastern PA basement mold remediation plan. Once your basement is clean and safe, Mastertech will recommend the appropriate preventative measures for the future. What causes mold in Pennsylvania? Yes. Some people may have stronger reactions to basement mold than others. This reaction depends on your immune systems, the length of time of exposure and several other factors, but many mold species can negatively affect everyone – even healthy adults. Since many Eastern PA basements contain HVAC components like air handlers and duct work, much of the air from your basement is circulated throughout the entire home. This is why we recommend a thorough duct cleaning with an antimicrobial after or during every mold remediation. Moisture Mapping– Your inspector will carefully map out the damp or wet areas of your basement to determine the moisture source. Report of Findings– Upon completion of your basement mold inspection in Eastern PA, your inspector will compile a clear and concise report that outlines all his/her findings. If deemed necessary, your inspector will present you with a detailed scope of work for a safe and effective basement mold remediation. The certified PA basement mold remediation professionals at MasterTech of Eastern PA will carefully develop the safest and most efficient basement mold remediation plan to thoroughly address your specific mold remediation needs. Each Mastertech mold remediation is backed by a 5-year, mold-free warranty. It is our promise that the mold has been successfully remediated, and it will not return. 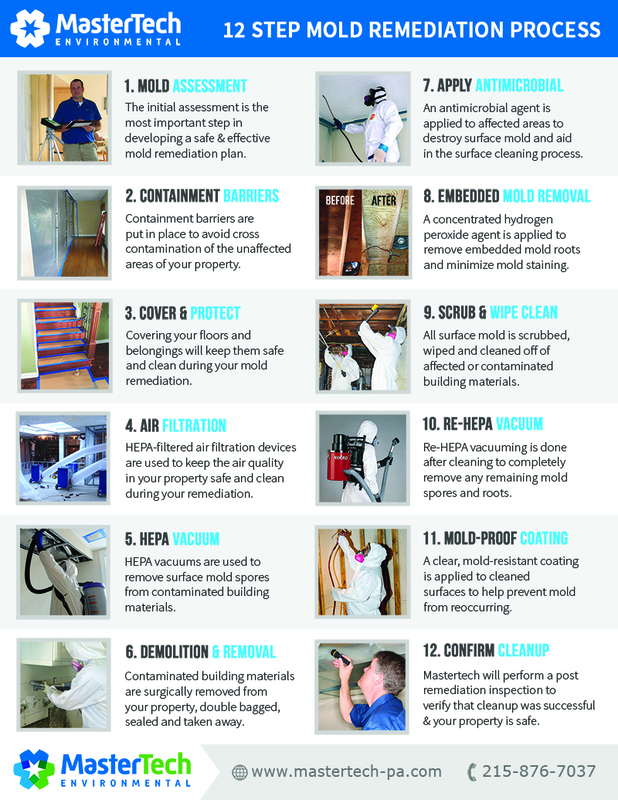 Call 1 (215) 876-7037 today for your Basement Mold Remediation Estimate. We will be happy to answer all your questions and schedule you for an appointment with one of our professional mold inspectors.